ACADEMIC, trainee priest, national park warden, teacher, builder, musician, doctor, campaigner, prolific writer and devoted family man. Little wonder that Chris, the wife of Prof Theodore MacDonald, who has died, aged 77, says he fitted six lives into the span of just one. The couple moved to Littlehampton from London a decade ago, and it seemed to prompt a rich new vein in his writing, with around a dozen volumes completed from their home in Granville Road, the last published on February 18, just a couple of weeks before he died from pneumonia in Worthing Hospital. People from all walks of life, many who had known Theo for many years, attended his funeral at St Mary’s, Littlehampton, on Thursday, the church he had attended for the past 10 years. There were warm tributes from family and friends. Son, Matthew, described him as a “truly remarkable man”, whose passion for human dignity and struggle for justice were an inspiration to all. The couple’s adopted son, David Thorneycroft, said: “He was a good man, a great character, who led an extraordinary life.” Theo’s legacy, he added, would be in the books he wrote, which would be talked about for years to come, the lives he saved as a doctor and the students he taught and inspired. Born in Quebec, Canada, one of six children, he had a Catholic Jesuit education and his potential was obvious from a young age – by the time he was 13 he had his first degree, in music, and was teaching. At 17, he was working with the Canadian Wildlife Service in national parks, and he also had spells as a biologist on Russian trawlers in the North Sea, and studying at a college in East Germany. His thirst for peace and justice saw Theo travel the USA in 1960 with Martin Luther King and his civil rights campaign group and around the same time he visited Cuba, founding a concern for that country which stayed with him for the rest of his life and led to numerous return trips to study and support health and education projects. 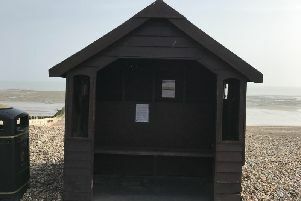 He was a familiar figure to many around Littlehampton and Rustington, taking long walks with his white stick and talking to himself as he worked out his arguments and theories. Theo is survived by Chris, their eight children, nine grandchildren and one great-grandson. Chris thanked the staff in the intensive care and high dependency units at Worthing Hospital for their “fantastic care, dedication and professionalism” in the six weeks Theo was a patient there.